The Diva's Weekly Challenge #215: "Labyrinth"
Drawing a labyrinth will be fun to show our grandchildren next visit. Thanks Laura for the links and lesson!! Beautiful, Looks like an actual beaded necklace. Wow! Your tile is amazingly 3d. GORGEOUS! Now that's rather brilliant, to draw the lines instead of the pathway. 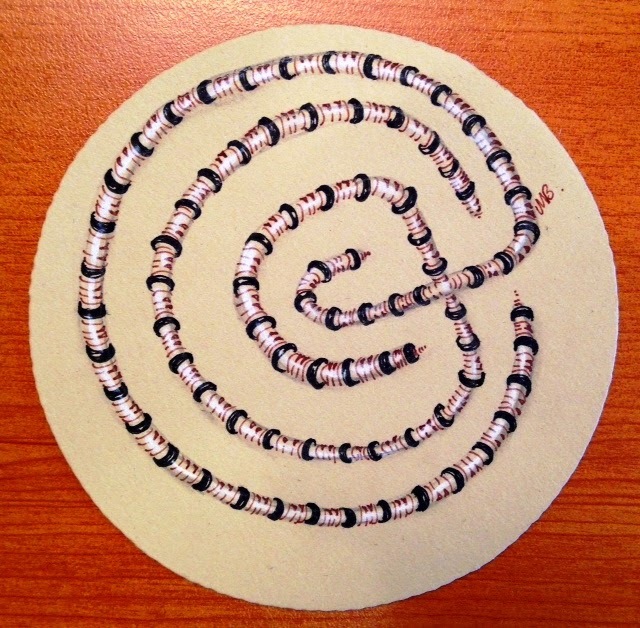 And a 3-circuit labyrinth certainly leaves more space to draw. Ooohhh, I shouldn't look at other people's before I do my own... I just get too many other ideas! Pretty. I like the shimmer and the colors you used. It has a lot of dimension. It is like a little bangle, a necklace or bracelet. Delicate and detailed. Beautiful! I bet the granchildren will try to lift it right off the page, it looks so 3-dimensional! Nice one!! I love the 3D effect. Really beautiful! My fingers can feel those beads right through the screen! Your delicate labyrinth is so delicately done and so beautifully dimensional that I can feel it almost as I finger-walk through your labyrinth. Beautifully done!